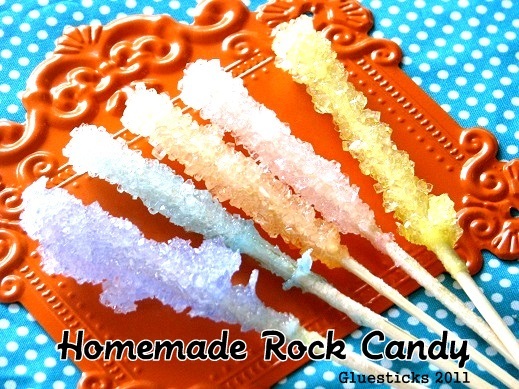 Mommy's Favorite Things: Rock Candy Tutorial!! You can find it Here. But I'll copy and paste too! This looks like so much fun and I'm so going to do this with Avery!!! The good thing is we have everything we need!! It's super easy! We've had fun trying our hands at some homemade candy recipes lately and are excited to share them with you! Homemade Rock Candy is incredibly easy to make. There are many variations and links online to help you along the way. We took bits and pieces of what we found and here is how we did it! 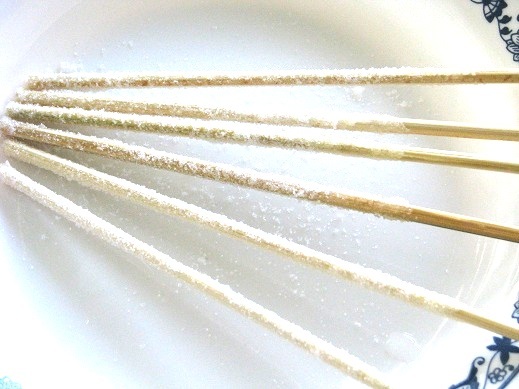 Trim down your skewers to a reasonable size to fit in whatever jars or cups that you will be using. You'll also want to get rid of the point. Dip them in water, then roll in sugar. Let dry completely and set aside. This gives the sugar a base. Something to stick to when it starts to crystallize. Mix equal parts of water and sugar in a pot on med-high heat until dissolved. Then continue to add sugar until you have AT LEAST a 2:1 ratio. You can also do a 3:1 ratio. 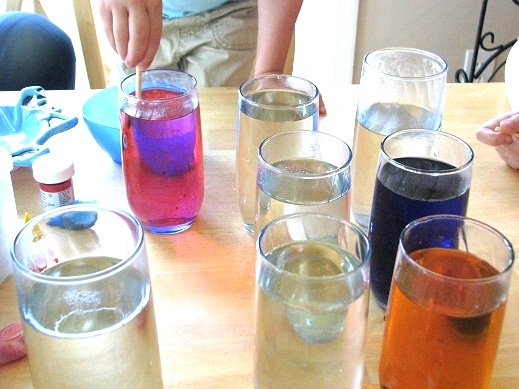 We used 8 cups of water and 16-18 cups of sugar and it made a lot. So you can definitely half the recipe. We wanted a lot of colors. You are making a nice, sticky, sugary syrup. Mix until completely dissolved and mixture starts to simmer. You do not need it to boil or bring it to a certain temperature with a candy thermometer. Easy. Allow your syrup to cool for 10 minutes or so and ladle into your jars using a funnel to catch spills. It is still pretty hot at this point. 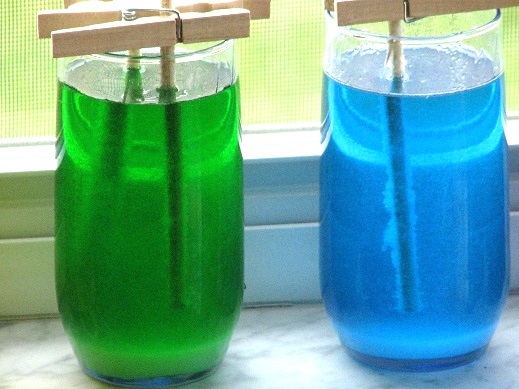 We used the tips that we trimmed off of our skewers and dipped them into concentrated food coloring paste, then swirled the skewer into our hot syrup mixture. 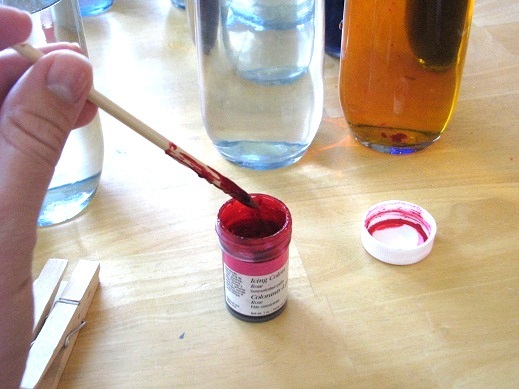 You can use liquid food coloring, but I like the paste better. Then attach a clothespin to each skewer (the ones you dipped in sugar and let dry) and place in cup. Make sure the skewer isn't touching the bottom or sides of jar/glass. They need room to grow. Since our glasses were narrow, one skewer seemed to work out best, but we added two in a few of the colors. Place your jars in a warm location with lots of natural light. Here they are on day one...you can see that there is a bit of sugar build up from when we dipped them in water and then let them dry in sugar. Day 5. The syrup is crystallizing on the bottom of the glasses as well. 7 days---DONE! We had a great time watching them grow and sampling the finished product. 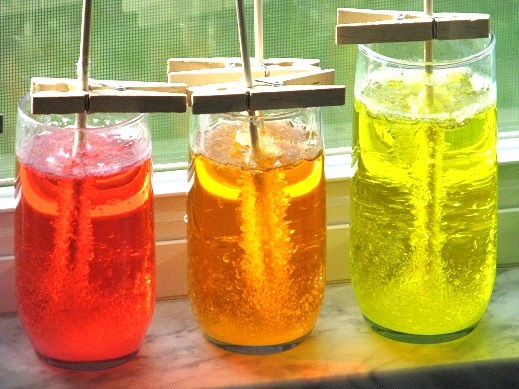 We did not add any flavorings to ours, just sugar and water, but it might be fun to try that sometime. In the end, the glasses with 1 skewer did better as they had more room to grow. So if you attempt to do more than one skewer/jar, use a wide mouth jar. The orange glass had two skewers and both turned out GREAT, but a couple of the other glasses with 2 were a bit smaller than the rest of the single skewered glasses. That ia awesome!I will have to do that with my daughter! Thanks!